This trail exceded my expectations. Mt. Graham and the Pinalenos are a spectacular sky island, with beautiful riparian trails and thick forests, scarred some by fires, as seems the norm in Arizona. It lacks a "ridgeline" trail system, most trails being up and down the mountain side. This trail has not escaped fire, but is the closest to a ridgeline system. The views are fabulous. You start at the end of the dirt road on top, unless you have 4wd and want to go through a few semi permanent mud holes, ignore the small sign for "Clark Peak TH" and simply take the main road a little over three miles to the dead end, which happens to be the TH you want. I only covered a little over 8 miles of this trail, to Taylor Pass, and did some off trail ridge walking to see more views. 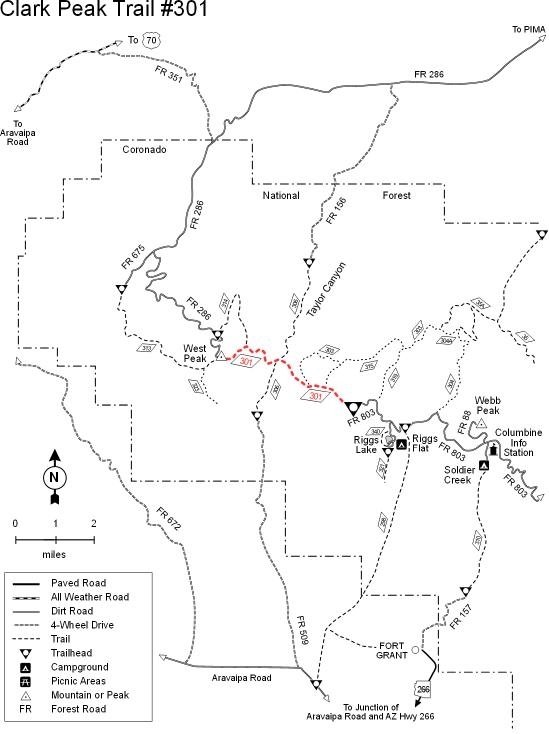 The forest service recommends a 2 day trip to do an out and back of the almost 14 mile trail, which terminates on West mountain. I am not sure why. The part of the trail I hiked on was in fair shape, rollercoaster like in elevation gain and loss, minimally overgrown. The trail grew faint as it descended the side of a ridge to Taylor Pass. Some other use trails in the area go to great dry campsites, or great view lunch sites. The trail starts at 9000 feet, skirts Clark Peak ( look for a couple of cairns for short walk up to summit) at a little over 10,000 feet, then drops about 2000 feet to Taylor Pass in the 7000's; where I turned around, then climbs to West Peak at 8600 to meet an old FS road. The route is waterless, so all water must be carried. There are several damp dirt areas which look quite spring like if they were dug out. The hike goes through old burn, with abundant flowers when I was there, healthy forests, wanders by beautiful rocky cliffs, through a huge open meadow of ferns, and to a newer burn area streaked with the red slurry near Taylor Pass. When I was here I ran into about 10 forest service fire fighters near Taylor Pass, resting on their packs, eventually going downhill to do some mop up work on the aftermath of this newer fire (several months back). Views west include the Galiuros, Rincons, Catalinas, Santa Theresas', Sulphur Springs Valley with all its' farming plots, etc. Views east of Safford playa and the mountains backing that area. It was hazy inititally then clearing on my hike out as big dark clouds started to roll in. There are some connecting trails to FS roads that come out of Pima etal if one wanted to do a long car shuttle. Or get dropped off at the top and picked up at the bottom somewhere. Better though to camp up top and do this trail as an in and out. You won't get tired of the views, that is for certain, lots of variety on this trial, and a new favorite for me. From Safford drive south 8 miles on US 191 to AZ 366 (Swift Trail). Turn right (southwest) onto AZ 366 and drive 29 miles to the Columbine Visitor Information Station. Continue along FR 803 (Swift Trail) about 5 miles to the Riggs Flat turnoff and then another 2 miles to the trailhead at the end of FR 803. The last 12 miles of this road are narrow and winding. This trailhead is not accessible from November 15 to April 15 when the Swift Trail is closed for the winter. Early or late snow may extend the inaccessible season.